Mrs. Alice Roberts Hemphill, 88, a lifelong resident of Murray County, died Wednesday morning in the Cherokee Acres Restorium, Calhoun, Ga. 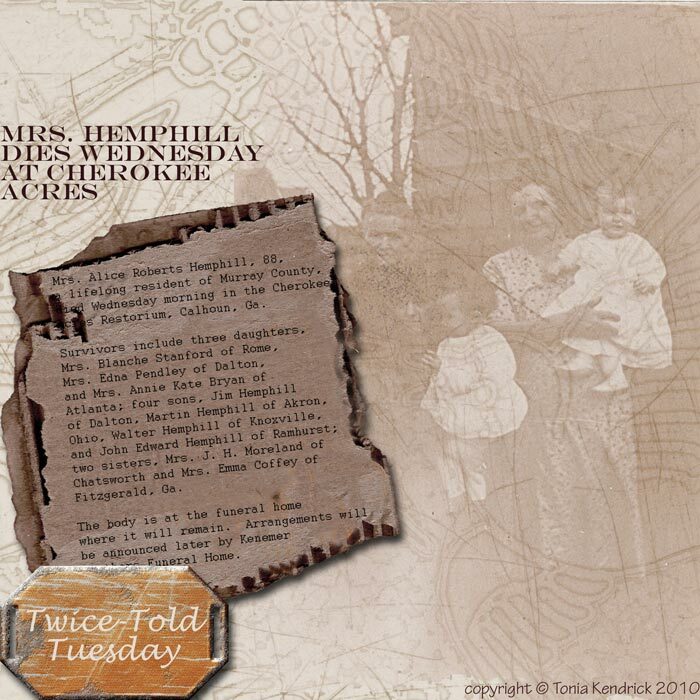 Survivors include three daughters, Mrs. Blanche Stanford of Rome, Mrs. Edna Pendley of Dalton, and Mrs. Annie Kate Bryan of Atlanta; four sons, Jim Hemphill of Dalton, Martin Hemphill of Akron, Ohio, Walter Hemphill of Knoxville, and John Edward Hemphill of Ramhurst; two sisters, Mrs. J. H. Moreland of Chatsworth and Mrs. Emma Coffey of Fitzgerald, Ga. The body is at the funeral home where it will remain. Arrangements will be announced later by Kenemer Brothers Funeral Home. This article was originally published in 1965, probably in The Chatsworth Times. Source: Hemphill Scrapbook; privately held by D. H. Davis, [ADDRESS FOR PRIVATE USE,] , D. H. Davis, “Mrs. 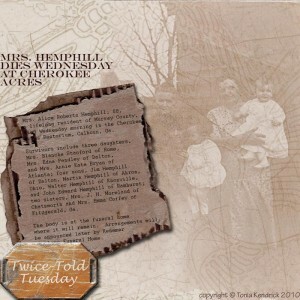 Hemphill dies Wednesday at Cherokee Acres,” undated clipping in unnamed newspaper, ca. 1965. Twice Told Tuesday is an ongoing series featuring family-related articles republished from old books, magazines, and newspapers. To see all posts in the series, click here.